While the flowers of Cinderella Roses are tiny, the bush is quite substantial. The bush can reach three feet in height which makes it a good choice for a small hedge. In our hot climate the flowers are mostly white, but in cooler climates and in early spring in warmer climates, the flowers have more of a blush of pink. So many roses on each bush make this a very striking ornamental plant. 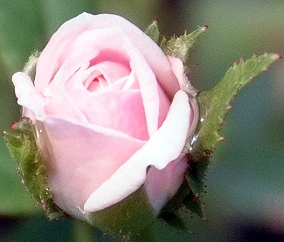 Cinderella Miniature Rose is ideally suited for hedging. It easily reaches three feet or more but takes well to shearing into shapes. It is also thornless which makes it nice in the mixed perennial garden or in a garden where children are present. Cinderella Miniature Rose would make a great addition to our Kid's Herb Garden.